The DAC8 peripheral lets you set the output voltage of eight 8-bit DAC channels. 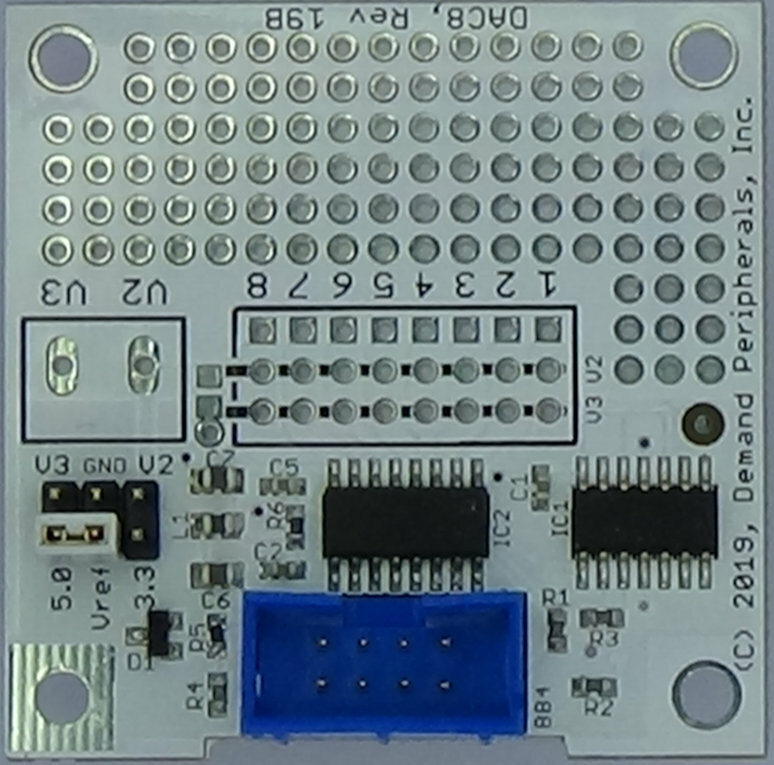 The dac88 peripheral card provides eight 8-bit digital-to-analog converters. A wire-wrap area on the card lets you add op-amps or other custom circuitry. The DAC outputs are routed to the pads of a 2x8 header. One side of the header is connected to ground so that you'll have a ground on every other line of a cable connected to the header. dacout : the output voltages as a space separated list of voltages in the range of 0 to 5.0 Volts. The voltages specified will be rounded to the nearest voltage available to the 8-bit DAC. This resource works with dpset and dpget. A dpget returns the actual voltage selected for the output. Set the eight output voltages to 0, 0.5, 1.0, 1.5, 2.0, 2.5, 3.0, and 3.5 Volts. The driver sets the actual voltage to the nearest value obtainable with eight bits of precision. For example, the 8-bit value closest to 1.0 Volts is 0.996 Volts.